It’s time to revisit the rendering settings we looked at when we were first learning about rendering single still images, and go over some of the stuff we skipped back then. We previously skipped over the second and third buttons in this panel: the second button is equivalent to CTRL + F12 (render animation), while the third one invokes your player, as configured in your user preferences, to play a rendered animation. We previously looked at the settings in the left column (spatial dimensions of the images), now look at the ones on the right (time dimensions). The “Start Frame” and “End Frame” numbers simply mirror the same values at the bottom of the Timeline window; changing these numbers in either place automatically changes them in the other place as well. These numbers determine which part of the animation sequence you want to render. These numbers are remapped frame numbers (see below about time remapping), so they don’t necessarily correspond directly to frame numbers in your timeline. 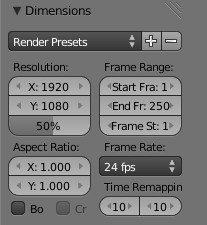 The “Frame Step” number, if set to a value n greater than 1, tells Blender not to render every frame, but only every nth frame. Like the scale factor in the image resolution, this gives you a faster render, handy for previewing, at the expense of lower quality. The “Frame Rate” controls how timeline frame numbers relate to actual time. The default value of 24fps is the usual value for film, while 25fps is the standard value for PAL video and 29.97fps for NTSC. The “Aspect Ratio” provides a pair of divisors for scaling to account for nonuniform pixel densities in the X and Y direction. If you are creating footage for the old standard-definition PAL or NTSC video formats, then these need to be set to suitable values (which you don’t have to calculate, since they can automatically be filled in by choosing the appropriate item from the preset menu). Otherwise, leave them at the default 1.0/1.0. The two fields labelled “Time Remapping” let you warp time, and speed up or slow down the animation from its original rate. The “old” value (on the left) is converted to a time interval in seconds by dividing by the specified frame rate, and then the “new” value (on the right) determines how many frames are actually rendered during that interval. If both values are the same (the default), then time remains unwarped, and the frame numbers correspond directly to timeline frame numbers. Blender’s output file formats include regular movie formats (e.g. MPEG, Ogg Theora), but you can also use a still-image format (e.g. PNG, OpenEXR). 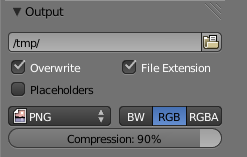 Outputting an animation to a still-image format involves generating a separate file for each frame, named according to the frame number, into the directory that is named in the box at the top of the “Output” panel. This editable field gives the location for saving animation renderings. Only animation sequences are automatically saved here; single still frames have to be explicitly saved from the Image Editor. If the path begins with “//”, then it is interpreted as a subdirectory of the parent directory containing the .blend file. Outputting straight to a movie format is fine if you don’t intend to do further processing of the resulting movie. Trouble is, that’s rarely true. You might need to adjust the images in some way, or edit the rendered sequence into a longer production along with other pieces. But most of these movie formats are designed only for playback, not for such additional processing and editing, and such processing requires decoding the movie format, doing the processing, then re-encoding again. This is generally a time-consuming process, and it leads to loss of quality. And you might discover that your renders didn’t come out right in the first place, and so you need to redo it all. It is quicker to get to this stage if Blender doesn’t have to do movie encoding as well. Therefore it is usually better to render your animation to a sequence of still frames. The files end up much larger, and there will be an awful lot of them, but they leave maximum room for you to do further processing with a minimum of quality loss. Once you have finished doing all your processing and editing, you can then encode the results to a regular movie format for delivery to your users, using a tool like FFmpeg which offers all kinds of fine-tuning over the encoding process that Blender cannot match. Nor is it Blender’s job to match. Having said all that... In these tutorials, you probably want to generate renders quickly and conveniently, without worrying too much about quality. For that purpose, by all means choose one of the “Movie” formats for animation rendering. If you don’t already have a player to hand that will handle any of the formats that Blender can generate, why not try VLC, which will play just about anything. You already learned how to use F12 to render a single still frame. In fact this renders the current frame—i.e. whatever the state of the model/scene is at the current frame time. Thus, you can go to different frame times and hit F12 to check how things look at crucial points, before doing a render of the entire animation, to save time in case you discover something doesn’t look right. Animation rendering can take a while. Consider a short animation sequence of, say 10 seconds at 25 frames per second—250 frames. If a single frame takes 10 seconds to render, then the whole sequence will take about 40 minutes. If a single frame takes a minute, then the whole animation will need over 4 hours to render. And it gets worse the longer the movie is. And so it goes. This is why commercial studios have renderfarms—to speed things up by rendering multiple frames concurrently. Make use of shorter, low-frame-rate, low-resolution renders when you can. This page was last edited on 7 October 2018, at 14:32.